and its main thought is “Ideas worth spreading.” A bit of back story: TED conferences are organized around the world, at minimal cost to attendees, and independently-organized conferences are designated by the lower-case “x” after the name. As I have been doing for a few years, you can watch various speakers whose TED and TEDx video messages are freely available online. A video can last anywhere from 5 to 20 minutes – not a lot of time required to learn, be inspired, or simply entertained. 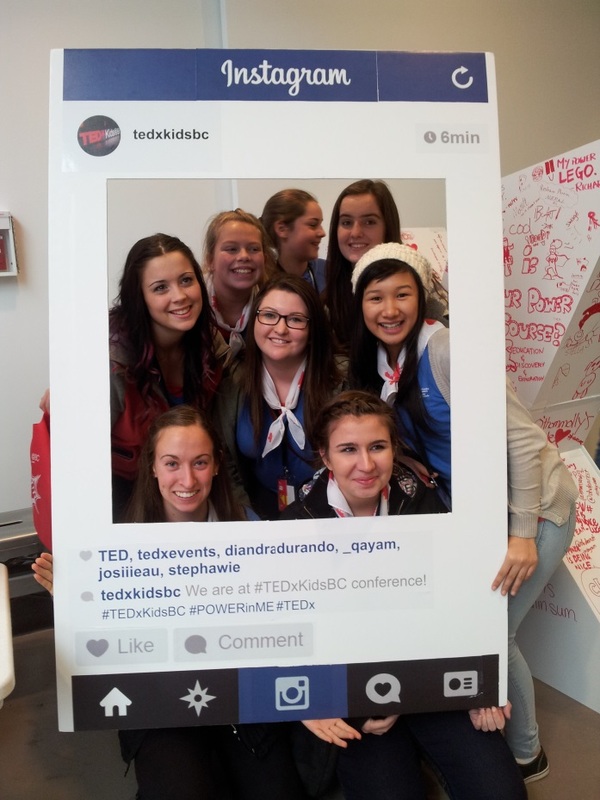 It came as a great delight to me to find out that there would be a TEDxKidsBC conference coming to Vancouver, so in October my co-Guider, Cindy, and I took seven of our Rangers to attend the conference at Telus World of Science. We didn’t have a lot of information up front about the speakers or performers, but once inside Science World, we were entertained by opening youth speaker Qayam Devji’s “If you want to get something done, talk to a kid” speech, followed by Jordan Bober’s Seedstock “Why transforming the economy is child’s play.” Abhay Sachal discussed his theory of creativity: how creativity makes life better, and is the key to getting things done. Stephanie Wiriahardja reminded everyone that each of us is our own living, breaking, walking brand, like Coca Cola, and asked what does our own brand – what we’ve been putting out there – say about us? A powerful and moving video shown of a previous TEDx talk given by 19-year-old Kevin Breel discussed the depression he faces, and how alone he felt on the inside while putting on another face to everyone on the outside. Entrepreneur and philanthropist Richard Loat encouraged everyone to tell their story, to be a voice and not an echo, and not to let anyone put an expiration date on your dreams and ambitions. Seventeen-year-old Kimberly Rutledge spoke of her sister who has Down’s syndrome, sharing that it’s alright to be yourself and fostering acceptance; Erina Park discussed “Disabling Ableism,” about the Best Buddies national program she brought to her high school. The last speaker of the day was 19-year-old Quinn Beasley, coming out on stage doing some juggling acts that made even me want to run away and join the circus before launching into his story of finding a love of circus at age 10, and making some personal choices and decisions that led to the loss of his beloved circus camps. This evolved into a life involving drugs, depression, and bullying, before finding his way back to a drug-free and circus-filled life once again. He was truly inspirational. TEDx conferences can be organized by anyone, anywhere; one of the speakers was an organizer of TEDxKids@Ambleside because he wanted to bring it to his community. Is your interest piqued? Start looking up a few of the TED Talks. Take your Pathfinders or Rangers to an event near you (or organize one yourself) – spending the day learning, being entertained and inspired and being compassionate toward others will be time very well spent. By guest blogger Robyn McDonald. Robyn is a Pathfinder and Ranger Guider in Telegraph Trail District, Fraser Skies Area, British Columbia. Some of her favourite TED Talks include those given by: Shawn Achor, Ben Zander, and Matt Cutts. This entry was posted in Awesome Activities and tagged meeting ideas. Bookmark the permalink.